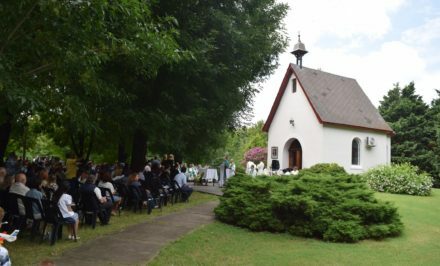 On July 16, 2017, the inclement, sweltering Texas weather took a holiday so we could celebrate the 75th Anniversary’s founding of the Schoenstatt Family Work. We miraculously had a somewhat overcast day with slightly lower temperatures. We were able to go through the day without perspiring profusely as happens during our very hot Texas summers. A real cause for joy and gratitude! The day began at the Shrine around 10:30 A.M. Several meaningful items graced the front of the Shrine: the Cross, our beautiful crowned MTA picture – Queen of the Families; the picture of our Father and Founder, Father Joseph Kentenich; an impressive picture of Dr. Fritz Kuehr and his wife, Helena, who were instrumental at the beginning of the Family Work; a candle, flowers and several banners, all pertaining to the Family Work. The Sisters’ music greatly added to the celebration. 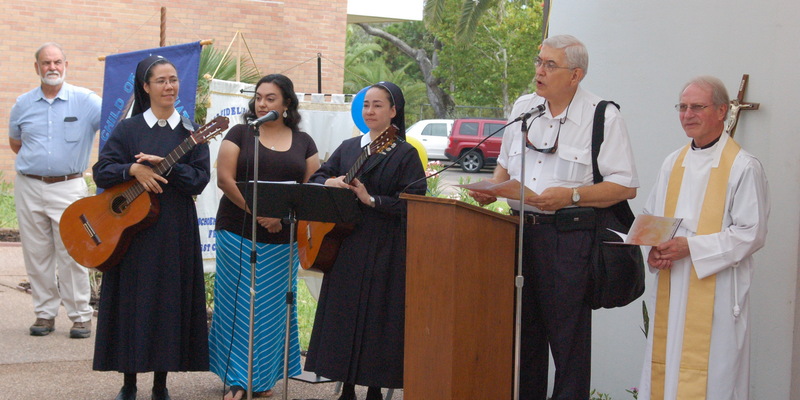 We were especially grateful for the presence of one of the Schoenstatt Fathers, Fr. Gerold Langsch. Fr. Gerold has served the Schoenstatt Family, off and on in Texas, for many years and is currently serving as pastor at St. Paul’s parish in Austin, Texas and continues to serve the Schoenstatt Family in various ways. 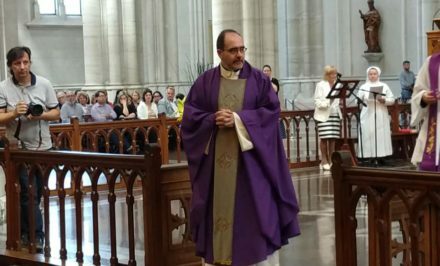 We also greatly appreciate the efforts of Sr. M. Mara Medina, who works for the Family Work in Texas and went to great lengths to coordinate the celebration. Fr. 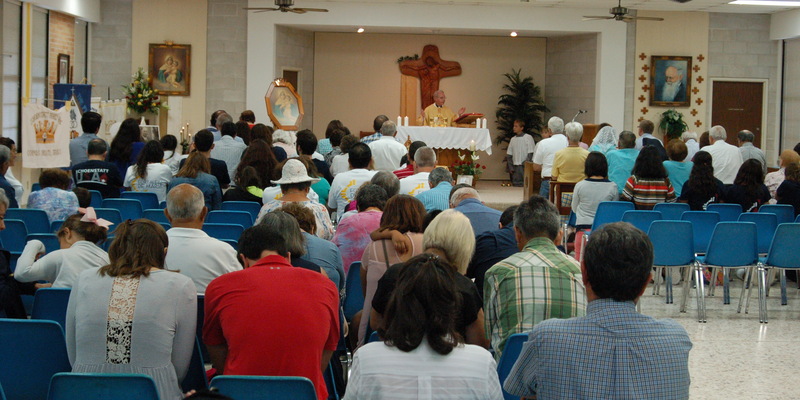 Langsch and Carlos Cantú, the Master of Ceremonies, conducted the opening prayer and ceremony at the Shrine. A Family born in an unlikely place…sound familiar? Father Kentenich founded the Family Work with Dr. Kuehr in Dachau on July 16, 1942. 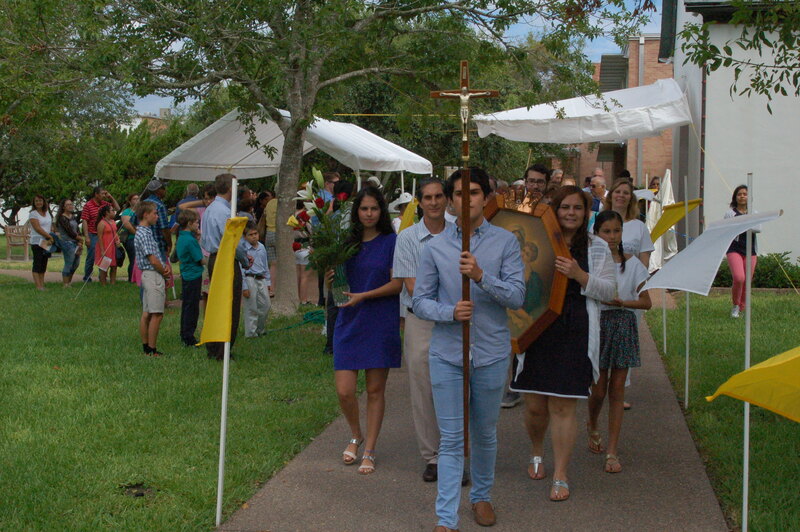 The Schoenstatt Family Institute, the Schoenstatt Family Federation, and the Schoenstatt Family League Family Work are all represented in Texas. On this occasion, all three entities were represented at Confidentia Shrine’s celebration. 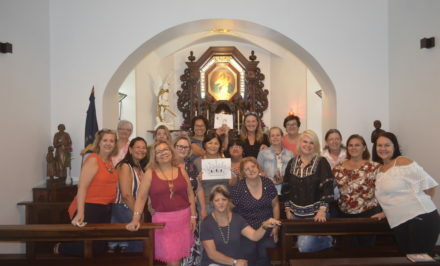 The celebration and the Holy Eucharist were spiritually connected with the celebration happening in Dachau, where the Family Work was founded in 1942, so a blessed spirit of family permeated our celebration. After our opening ceremony and prayer, we went in procession to the training center. Couples from Corpus Christi, led by the Norman family, prepared a time of adoration before the celebration of Holy Mass. Reverence, silence, and dim lights were a significant and effective portrayal evoking the event, which occurred in Dachau in 1942. In this scene, María Rodríguez, from Family Federation Course 2, sat at a desk writing a letter portraying Helena Kuehr writing a letter to her husband, Dr. Fritz Keuhr. While María was acting out writing the letter, it was being read solemnly in the background. It was a letter between husband and wife who were assessing all that had taken place and were discussing their present situation. All in all, it was a moving experience for all present. 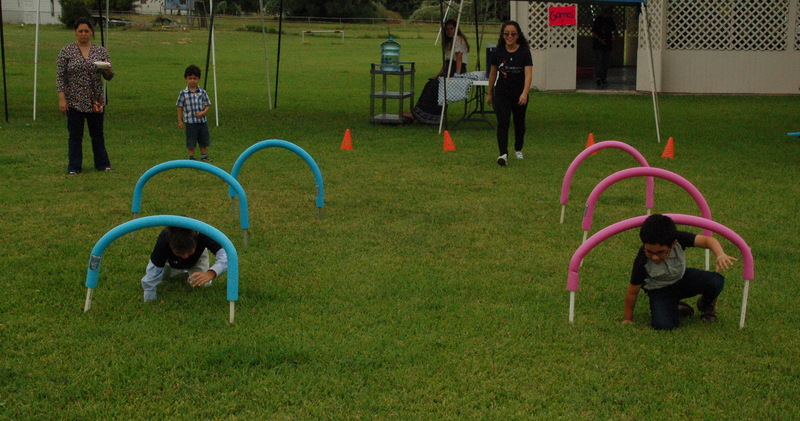 After lunch, fun and games, we heard Víctor and Olga Alegría’s, from the Schoenstatt Family Institute, presentation. 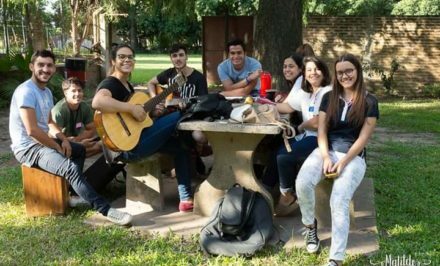 The Alegrías first announced a list of books that emphasize the founding of the Schoenstatt Family Work, following by a summary of the Schoenstatt Family Branches’ history. 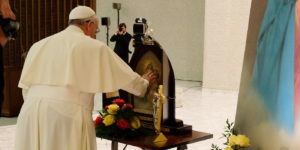 “Your Shrine is our Nazareth where Christ, the Sun, warmly shines. our holy mission may demand of us. from the universe now and in all eternity. As soon as our celebration came to an end, the scorching sun re-emerged from the clouds where it had remained hidden throughout the day so that we could have comfortable weather for our celebration…..but then it was warmly shining to remind us of our task, our mission, in proclaiming the Covenant of Love from Blessed Mother’s Schoenstatt Shrine!